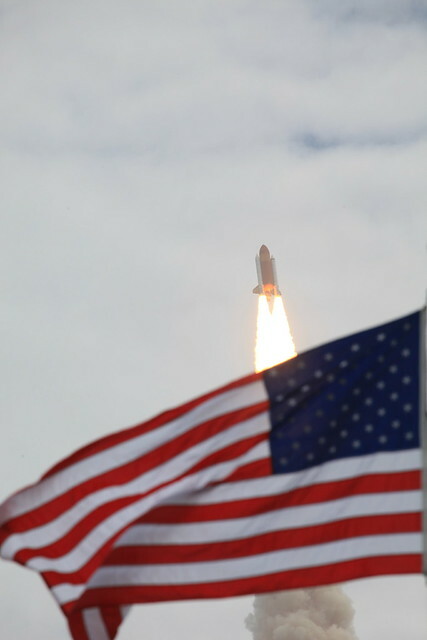 At 11:29 Eastern (US) time, the Space Shuttle Atlantis roared into space for the last time. I have mixed feelings about the Shuttle, NASA, and our future in space — you can read about that here — but it doesn’t change the fact that watching a Shuttle shed the bonds of Earth and leap into space is still a magnificent thing to do. This may be the last launch of the Shuttle, but it is not the final step for mankind. Private industry is there, other nations are still launching, and I have hope that through hard work America will once again lead the way to the final frontier. And it won’t just be into orbit, which is, after all, still bound to Earth. It will be beyond, back to the Moon, on to Mars, on to near-Earth asteroids, and eventually into deep space. It may take decades, even centuries, but the human-populated solar system I dreamed and read about, the one I still imagine, will come to life some day. We just have to choose to make it happen.